I found the color scheme in my Color Coach! I used Primrose Petals, So Saffron and Baja Breeze with some accents of Very Vanilla. I love how it turned out... originally I was going to leave it plain but I had to add some little butterflies to finish off my card! Please join us and post your creations for our challenge! Very pretty card, your little butterflies are lovely. Very pretty!! 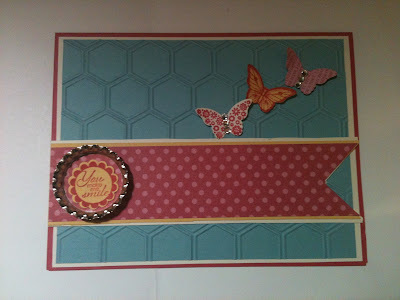 Love the butterflies and the honeycomb!! !